This series has been such a throwback to fun, over-the-top super hero comics. Last time we checked in with Hawk and Dove, they were trying to save President Obama from the evil Condor and Swan. Did they have get Barack back? Of course they did. Issue #3 was filled with ridiculous fighting and destruction through the White House. How ridiculous? 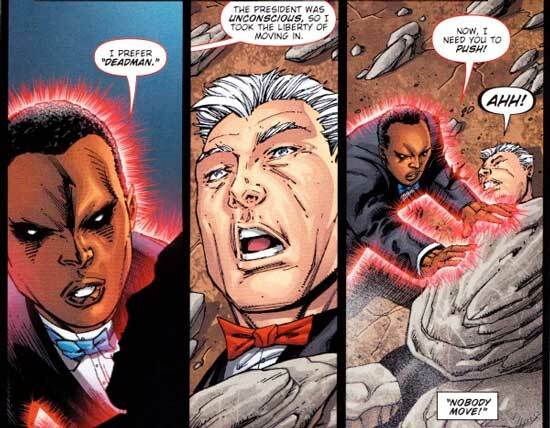 Deadman even gets involved in the action, “possessing” Obama for a little bit. How crazy is that. Issues like this really show Rob Liefeld’s strength as an artist. The issue ends with Hawk and Dove taking Condor into custody. The next issue is writer Sterling Gates’ time to shine. Hawk and Dove have an opportunity to interrogate Condor. It’s a very well written, slow burn story that crescendos with Swan rescuing her partner in crime and revealing that this was all an elaborate setup to kidnap Deadman! Seriously, go read these. Hawk and Dove definitely falls into the comics are fun category. I would say that this and Batgirl are the best of the New 52 books I’ve read. This entry was posted in Uncategorized and tagged barack obama, condor, deadman, dove, hawk, hawk and dove, rob liefeld, sterling gates, swan by Chris. Bookmark the permalink.